It’s been just over a week since I took a graceful plunge in my garage while attempting simple task of cleaning my vehicle. Last Friday I met with the orthopedist and he decided that a cast would be the best way to treat my injury. He looked me right in the eye and he said this, “If I were to fracture my hand, I would want your fracture.” I take that as a good message to hear from your doctor. However he did feel that a cast was the best way to ensure no pain and good healing. And it’s only for four weeks. I did have a few moments over the weekend of feeling a little sorry for myself and quite possibly some tears were shed, but it was short-lived because in the scheme of things this is manageable. Now that I have the cast on I can pull up my pants using both hands. It’s the little things, people. You know I’m saying? Food prep that involves using a knife. Try as I may, I cannot hold a vegetable with my left hand in anyway, shape or form. Cooking food from scratch, other than very simple things like dumping something into a pan and turning on the stove, are kind of out for now. Also, I have been without a microwave for a week because ours died and our new one is on order. Man, I hope that sucker shows up soon. Taking the trash out. I can’t lift the bag out with my good hand. My good hand already has wrist issues because I’m a graphic designer and I point and click for a living. It’s taken its toll over the years. This is why it’s good to have other people in the house on trash duty. Taking along, luxurious shower. I bought a cast cover designed for showering, but I can’t actually get it over my cast yet without fear of pain so I’m using a garbage bag cinched up with a Velcro cable tie. And let’s be real here, I shouldn’t be taking long, luxurious showers anyway. Water is life! Cart wheels. Couldn’t do them before, can’t do them now. Speak any foreign languages. Aside from understanding a scant few phrases in French, I still can’t speak another language. Order meals to be delivered to my home from Omaha steaks, specifically their crockpot meals. A friend of mine told me about this company and so far we’ve had three of the meals, two of which I would order again, and in fact, I just placed my second order yesterday. Dan works 12 hour days right now as an elementary school teacher, and we don’t want to live on takeout food. The thing that’s cool about this company is that it’s not processed food. And the cost for five meals is about the same that I would pay on an average trip to the grocery store shopping for two or three. Work. As soon as this happened I almost had an anxiety attack over how I was going to get work done. While it is true that I cannot make any physical scrapbook pages or cards right now, because I can’t use a paper trimmer, I can still do my work as a graphic designer. True, I am probably spending twice the amount of time to complete tasks, but I am not completely incapacitated and this is critical. As a self-employed person I don’t have disability insurance. I think maybe I should look into that going forward, because had this been my dominant hand, I would be unable to earn an income for at least four weeks, if not longer, and that doesn’t work for my family. The only limitation I’m facing is that I have to take frequent breaks so that my uninjured arm and wrist do not decide to completely revolt against me. Wake up each day and be grateful that I am here and that it wasn’t worse. Maybe this happened it just the right time, because it’s definitely making my 30 Days of Thankful project different than it’s ever been before. Oh, and the best thing that I can do in this process? Is use my iMac’s voice dictation feature. While it is not perfect, it has allowed me to respond to emails, to write blog posts such as this one, and to add text while I’m working as needed. Again, I appreciate all the well wishes. And the count down to December 1 continues. If this is coloring my 30 Days of Thankful project certain way, I would imagine that getting my cast off will really create a joyful December Daily project, and I’m definitely participating this year. You can still join in my 30 Days of Thankful project! Plus, all of my digital products are on sale for 40% off as part of the quarterly sale over at Designer Digitals! The sale ends Friday morning at 6 AM Eastern time. Surely your son could step in and cook for the next 4 weeks? And maybe your husband at weekends or any early days? Sounds like you’re trying to make the best of it. Hope you feel better soon. Can’t your family do the cooking for you? They don’t really cook. And my husband leaves the house at 6:30 and gets home at around 630 or 7 PM Monday through Friday. I’m just finding solutions that will work and minimize the stress on them. I understand. But your son could do it yes? And if he doesn’t know how to cook at this age, surely it’s more than high time to learn so this would be an excellent time and you could supervise him by telling him/teaching him what to do? good idea! He’s already been grocery shopping with me which is been kind of fun! I think YOU can rock just about any challenge set before you….just sayin! Because of your trials lately, I taught myself how to use the voice to text option on my phone, so cool…and I don’t even have a broken hand! Thanks for pushing me to learn something new!! When my husband broke his wrist, we found the best thing to cover it for the shower was one of those umbrella bags like you find in Walmart at the entrance. Much easier than a garbage bag. Feel better soon. PS–love your videos and sense of humor. I love the cast! It is really cool! If nothing else, you are well accessorized for a few weeks. You have such a vast amount of knowledge that I am always eager to learn from you. Thank you for sharing your craft and for helping us all have more clean, simple and well designed pages even through the pain of it all. Hopefully you will have a little more time to relax and take care of Cathy a little bit too! Heal quickly and enjoy being pampered a little bit too! I figured the black would go with everything! I am glad to see you have figured out how to not over-do it. That’s hard for people like us who are used to tacking on everything ourselves! Thank you for sharing the bits about the Omaha steaks. My in laws got us several things from there last Christmas and each one was super yummy! We may just be trying some of those crock pot meals next! I know I should look into the tablet but I don’t hold a pencil or pen like most people. I hold it in a really awkward and uncomfortable way and I always have, it’s just how I learned to write so I just don’t feel fluid at all when I have a pen in my hand. I completely understand! If it helps any, I don’t hold a pencil like most people either. I have reversed nerves going to some of my fingers and because of that, my pinky and thumb are switched & my pointer and ring fingers are switched. As a child I was extremely clumsy (we never knew why until I was in 10th grade and had nerve testing done after a wrist injury). It totally explained why my fine motor skills were horrible as a child. Anyway, I hold a pen/pencil between my thumb and ring fingers with my pointer finger and the one next to it kinda scrunched on the thumb side. I’ll post a picture and tag you on IG so you can see what I’m talking about. 🙂 It’s a little bit of a learning curve to get used to a stylus over a mouse but it is so much better for your wrists. Cathy, try Glad Press & Seal to cover your cast. It works like a charm covering injuries in the shower. I broke my elbow and used it every day for six weeks! Do you mean just cover the whole cast with press and seal? Because I have that! Yes, it works great and no added bulk. I think Jennifer McGuire’s husband invented Press & Seal. So how is that for crafting helping every aspect of our lives? Cathy, your attitude does wonders for my mood! It is all perspective, isn’t it? It is our choice so much of the time when we take a minute to decide. I just saw on someone else’s blog that they loved press and seal during a similar injury. Good luck! When my daughter broke her hand, the first doctor put her in a soft cast. She was still in a lot of pain when that came off, so he put her in a hard cast. Fast forward a year or two, and she had to have surgery by a very good orthopedic specialist (he operates on future NFL players), which I suspect would have been avoided by just doing the hard cast in the first place. And for showering, we used bovine obstetrical gloves! Just google if you’re not sure they’re really what you’re thinking–they are! All of the way up to the shoulder, and cute colors–we had hot pink. Our dog’s vet ordered them for us from his supplier, they came in a day or two, and they were so much better than taping on a Walmart bag. The vet got the biggest kick out of it! Hope some of this proves to be helpful, or at least makes you smile! OK I’m gonna check out the gloves because the shower cast cover that I bought through Amazon has an opening it is so tight I don’t even know how I would get it over my cast without pain. lol. Cathy, the gloves my daughter used are made by Kane Enterprises, Ag-Tek division. I couldn’t find the exact ones anywhere (probably easier to go through a vet), but the same type of gloves are also called Field Dressing gloves (for cleaning game after hunting) and breeder sleeves. Hope that helps! Your mix of gratitude for what you have and what could have been with just enough sarcasm is what makes you so real and authentic Cathy. And I love it! I hope for complete healing and that you keep your sense of humor throughout your recovery. I look forward to your class in 2018! If you order the bovine obstetrical gloves, you definitely need to post a picture! Stay positive! Bovine Obstetrical Gloves. Not something you hear every day. Good stuff. Also a good band name. Hugs to you, Cathy…. i hope you feel better soon. it is so frustrating to be injured & have to take things easy or be forced to let some things go for a while. hang in there! When I had surgery on my arm I bought the leg cast bag. It’s just a little bigger but the opening was normal size. The arm bag is ridiculously small. Wishing you well! Cathy, I chuckled when I read the “surely your son can cook” comments. I have a couple of those son things (24 & 18) and while they both “can” cook the real question for me is do I really want to eat what they “will” cook. Don’t get me wrong, they have the basic skills to survive but there is no telling what mama will get when they come out of the kitchen and I am rarely ready for that:) Hope you feel better soon and glad that you’re able to see the bright side of what you’re going through. Yeah I guess I chuckled too. My son can make food, as he often does make separate food when he doesn’t like what we are eating. But right now I’m just trying to focus on preserving getting work done because I’m the breadwinner in this family so that’s priority number one. Ordering from a company like Omaha steaks is a good solution for us right now. As long as it comes with the duck I’ll consider signing up. When I broke my right wrist, I was given a tool for the kitchen that looks like a metal hair pick lots of teeth about 2″ long. You can stab vegetables and other foods with it and cut them, etc. It is still a great kitchen tool. Ahhh…being self employed definitely has its perks, but no disability, sick leave, or paid holidays & vacations stinks!! Wishing you the best during these next few weeks. Oh, and a big shout out to your husband. Thank you baby Jesus for teachers willing to put that much time in for our kids. I will give them the shout out. I think he could use one. I spent three months in a leg cast halfway up my thigh back in the day before Press-n-Seal and phones with internet. Not a single book or publication could I find on how to cope when you’re self employed and have to sit at a giant computer daily. So one more thing to be grateful for – you broke your wrist now instead of 20 years ago! On the plus side, I got to see the whole OJ trial as it happened from the comfort of my couch. Good times. omg, the OJ trial… I was not self-employed during that time! You have an incredible spirit Cathy. Chin up, is always the best strategy. Which of the crock pot meals did you enjoy? I really loved the beef bourguignon. I ordered another one of those because it was just so good. I also like the white chicken chili, which we had last night and we will have again tonight by adding a few cups of chicken broth to stretch it out because it was a little sick but delicious. I didn’t love the chicken and dumplings mostly because I didn’t love the dumplings but everything else and it was great. Those are the first three we have tried and we have two more to try and then five more coming this weekend. Hang in there, it sounds like you are doing pretty well overall! I don’t know how you can make it with a broken arm and a broken microwave, but more power to you! You must have a rent to own place nearby, I might check on a rental if I were you. And let’s face it, who wants to take out the trash anyway, that’s what husbands are for. I almost spit out my water (note: water, not soda) when you talked about the cartwheel, I tried a couple of years ago in front of my granddaughter and thought I was going to die, the things it did to my back still haunt me to this day. I’m calling the microwave place today. It’s a specialty item because we have a weird space that it has to fit kind of like a built-in but not really. Yeah, cart wheels, not for the faint of heart. 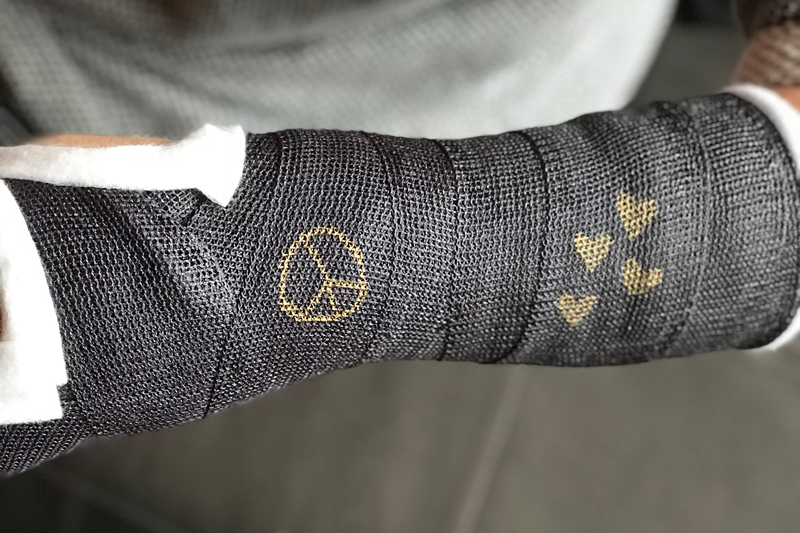 Hey Cathy — my spouse just had carpal tunnel surgery and she used Curad’s Cast and Bandage Protector to keep her cast dry when she showered. Simple to use and worked perfectly!! Ordered from Amazon for about $6. The package contains 2, but each one can be reused many times. Might be worth a look. If you’re interested, just search ‘Curad Cast Protector Adult Arm, 2 Count’ on Amazon’s website. Wishing you Godspeed! I fractured my shoulder this year….tripping over cords in the operating room where I was working (How ironic, eh?). Yes, be thankful for the little things. I am still working on getting a bra on my myself and blow drying that ONE spot up high on my head. Four weeks is nothing!! ouch! Yes, I am really glad that it’s not longer than four weeks in the cast. I have been following your blog for +10 years. That is possible right?? And I feel like I am your friend though you don’t know me and I never comment. I just want to say this too shall pass. You are awesome! This is a blip in the road. Keep on Keeping on CZ!!! Hey Christine, yes that is possible because I started blogging in 2005 stop blogging for four months and then came back in January 2007. And yeah, it’s just a blip. casts are known as stookies here. they didn’t used to come in different colours! nice list. but can you play the violin?! Well you learn something new every day. I didn’t realize they came in a variety of colors either, but they do! no violin for me, lol. I’m so sorry about this, Cathy. And I feel your pain – quite literally. I skidded feet first down our stairs on October 6 & broke the very top of my tibia (the shin bone) so I pretty much have a broken knee. I also relate very well to your frustration about trying to do things – for the first week+ I was in a knee immobilizer (that’s an official term – I saw the box at the ER!) & doing almost everything was not only painful but nearly impossible. Think about everything you do. Notice when you bend your legs. Now imagine doing whatever that is without bending your knee or putting one of your feet down. Yeah, it sucked. Luckily, I was put in a bending brace in my second week (the PAIN of bending a broken knee that had been immobilized for over a week does not bear thinking about) so life became a wee bit easier. And as it’s healed, easier still. I’m still on crutches (& still sleeping in our living room – I can’t get up the stairs) but I’m at the point where I can put my foot down & walk on it but only when I take the weight off it with the crutches. I have an appt with my ortho on Monday to talk about how I’m healing & whether I’ll need PT. And we’ll likely be discussing the knee replacement I’m going to need. I’m glad to hear you’re adapting. I’m thrilled you got such a cool cast. And I wish you a painless & fast recovery. Or at least that the time seem to fly by for you! Oh Sarah, this sounds really hard what you are dealing with. You have my sympathy because that is really challenging. I have heard that going through something like this definitely changes your perspective on life, how you move about in the world, and how you look at others who are struggling. You do not sound pathetic at all. You sound like a woman who’s handling it. Sending hugs. Thinking of you!!! I tore my ACL a couple months back and am still feeling it at times. I feel your panic, I feels for your relying on others to help, I feel your not being able to do things on your own that should be no problem that you have done a million times before!!! Best of luck in healing! Thanks Nicole! Did you have surgery on it? Hope you’re feeling better too! For your good wrist I recommend wearing a splint at night. You should be able to pick one up at your local drugstore and you should look for the one that has a slight bend at the palm of your hand [not straight!] so your carpal tunnel has the opening needed for good blood flow. Having that one rest at night allows for recovery during the day. I find that trying to wear a splint during the day is awkward and can make things worse. That is a good tip! I have two braces for my wrists that I used quite heavily a number of years ago for sleeping. I need to dig them out! To say I am enjoying rhese posts seems… mean. But I am. Bovine gloves! I broke my ankle while hiking on the second day of our vacation in Kauai. Yeah yeah, but a simple break, no surgery, they gave me a walking boot and just said “don’t swim.” (Garbage bags, a beach chair and a hair dryer fixed that.) Plus my husband & kiddos brought me food, wine, and mai tais on the lanai while my boot dried and ankle iced. However when I got home and got a cast 2 weeks post break orthopedist said 3 weeks cast, 1 more in the boot then gym shoes. It ended up being 5 weeks (tears, as gardening is my therapy and my legs swelled in its cast when I went out in the heat) plus 3 more in the boot. Slow healer. And I didn’t TOUCH Ibuprofen, they told me that slows bone growth? So, fingers crossed you have excellent healing!